A warning is triggered for extern methods which are not implemented. Place the editor cursor on the warning's line and press Ctrl + 1, select Implement extern function ... or Implement extern task ... from the list of quick fix proposals and press Enter. 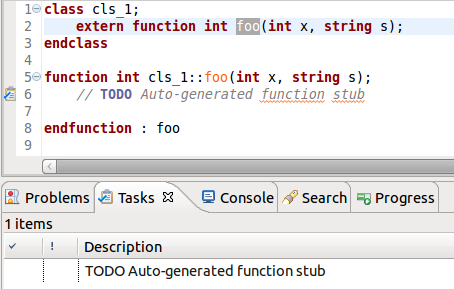 The extern task or function implementation is inserted outside the class scope. Note: The implementation stub contains a TODO reminder which shows up the Tasks View. See Track Tasks using TODO Markers.